Beware of this and other copycat tablets like it. If you are in the market for a tablet, do your homework first. These tablets do run Android, and the one I tested was quite compatible with most Android apps. However, these tablets do not perform anything like an iPad. 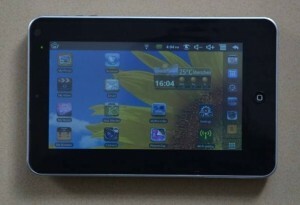 It has a “resistive” touch screen that requires a stylus, or fingernail, to operate. Using the tip of your finger just will not work, which makes this tablet hard to use. You need to look for a “capacitive” touch screen, which you can use your fingertips for navigating. It’s InfoTMIC 800MHz CPU is very slow in handling the software. It also says it has 186 MB of RAM, but in reality, you end up with at most 25 MB of RAM to run your programs with. The tablet I tested included Ethernet, WiFi, and 3G for networking. Ethernet worked flawlessly using the supplied dongle, but that is where the fun ended. WiFi signals were very weak, and dropped in and out unless you were right next to the router. There are modifications on the internet that remedy this problem however, and 3G was non-existent. Other problems with this tablet include the built-in stereo speakers. The speakers in the tablet I tested were barely audible with the volume turned all the way up. It also included a set of “ear-bud” headphones that did not help any as they were barely audible also. Another issue I had was the screen cover was very cheap, and within one week of moderate use, the screen had very visible scratches on it from the stylus. This tablet is cheap (about 50-80 USD), but is not worth the trouble. It is too slow and with the weak WiFi, almost useless. So be careful about what tablet to buy. Get a quality tablet, it may cost more, but it will be worth it in the long run.